What's left of Canada's automotive industry? Canada’s automotive industry isn’t what it once was, having shrunk from producing about 3.1 million vehicles at its peak in 1999 to roughly 2 million today. However, the sector continues to be important to the economy, directly employing about 125,000 Canadians across eight vehicle assembly plants in Ontario and at more than 700 parts manufacturers. Here’s a look at what’s left of industry in Canada, based on figures from the Canadian Vehicle Manufacturers’ Association. The numbers do not include those who work at dealerships. GM employs approximately 8,700 people in Canada. Its Oshawa Assembly Plant produces the Chevrolet Impala, Cadillac XTS, Chevrolet Silverado and GMC Sierra. The CAMI Assembly Plant in Ingersoll makes the Chevrolet Equinox. There are also major operations in St. Catharines and Markham. Multiple sources have told CTV Toronto that GM will cease all operations in Oshawa, affecting about 2,500 union and 300 salaried jobs. Fiat Chrysler employs about 12,000 people in Canada. Most of them work producing the Chrysler Pacifica and Dodge Grand Caravan minivans in Windsor, Ont., and the Chrysler 300, Dodge Charger and Dodge Challenger in Brampton, Ont. Ford employs about 8,000 people in Canada, mainly in Oakville, Ont., where workers produce the Ford Edge, For Flex, Ford GT, Lincoln MKT and Lincoln MKX. 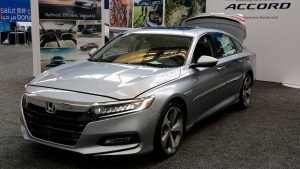 Honda has been building vehicles in Canada since 1986, when it opened in Alliston, Ont. As of 2017, there were 4,200 Honda employees at its plants in Alliston. They make the Honda Civic and Honda CR-V.
Toyota Motor Manufacturing Canada Inc., located in Cambridge and Woodstock, Ont., employs nearly 8,000 people, making the Toyota Corolla, Toyota RAV4, Lexus RX 350 and Lexus RX 450h.